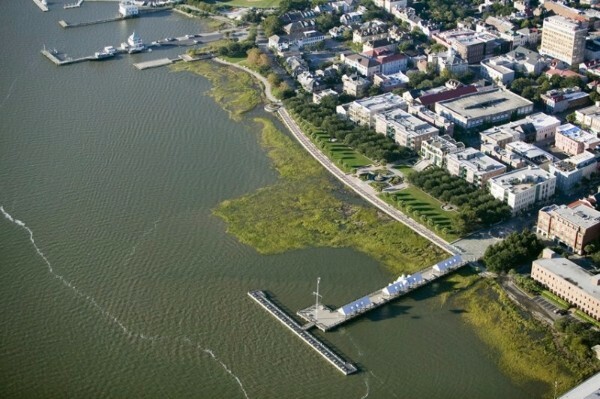 Although it seems like Charleston's waterfront park has always been there, it's actually only been around for 26 years. Joe Riley took up the cause to build what would become one of Charleston's most famous landmarks shortly after his 1975 election to the mayor's office. Y'all probably know that the 12-acre parcel of land that comprises the park was once a concentration of thriving wharves--including Brown's Wharf and Accommodation Wharf--but did you know that Charleston's once-thriving passenger steamship port was located here as well? Yep, it's true! The Clyde Steamship Line was established in 1844 by Thomas Clyde, connecting Philadelphia with the rest of the East Coast; it's headquarters moved to New York City in 1872 and it began serving the port of Charleston in its coastwise trade in 1869. 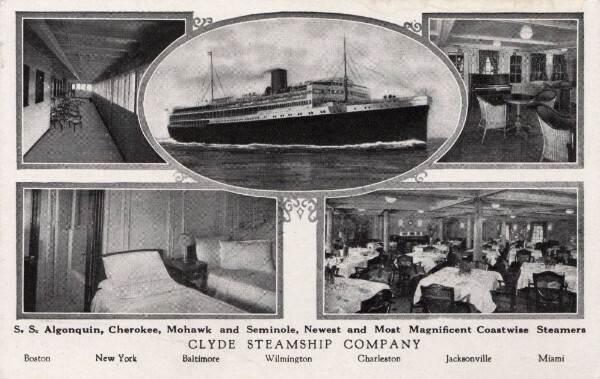 In its heyday in the early 20th century, the Clyde Line (later the Clyde-Mallory Line) offered Charlestonians sea voyage on luxury passenger liners four times a week. The steamships Cherokee and Seminole stopped in Charleston on their two-and-a half day trips between New York and Jacksonville, Florida. Built in 1925, these two ships and their sisters, the Algonquin and the Mohawk, were 402 feet long and 55 feet wide. They carried 446 passengers and had 252,500 cubic feet of freight. sometimes, the Iroquis or the Shawnee, larger vessels with accommodations for 723 passengers, were used when one of the others was in dry-dock. Anyone see a pattern in the Clyde Line ship names? An odd advertising tack to take, but the travel brochure for Clyde Line ships addresses one concern of potential sea travelers, right? Local papers and visitors' guides from the time recount the conditions of the 'luxuriously supplied' ships: "The social halls, corridors, smoking and reading rooms, are all large, convenient to each other and attractively furnished, being finished in white and gold. The decks are long and wide, the promenade deck being covered with a permanent wooden roof that affords protection against sun and rain. The staterooms are cozy, sufficiently roomy to be comfortable, and are well ventilated. In summer the windward or shaded sides of the promenade decks provide ample means for lounging in comfortable chairs, while in winter they offer the best of facilities for brisk and invigorating walks in the crisp and bracing sea air." Sounds pretty spiffy, doesn't it? The Clyde Line passenger ships served Charleston until 1942, when their ships were assigned to the war effort. By that time, several generations of Charlestonians had made fond memories of sea voyages to New York and Florida after paying their fare at the ticket office on the corner of Vendue Range and East Bay Street--in the building now part of The Vendue Art Hotel. 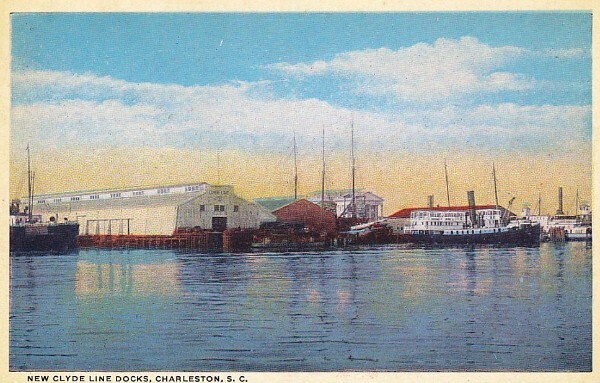 The three finger docks on Prioleau Street facing Vendue Range at the foot of Queen Street were built in 1915, and Pier 3 was rebuilt after a fire destroyed it in 1936. 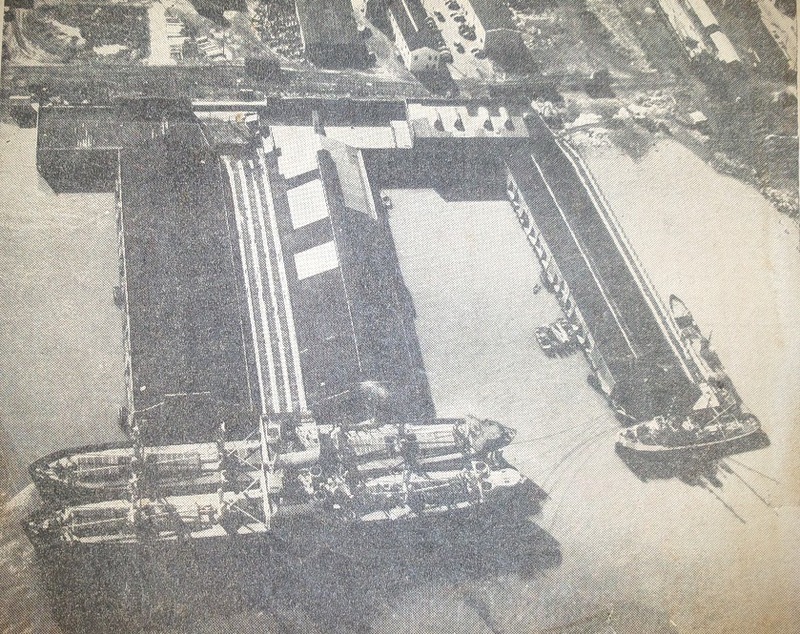 The docks were little used after the passenger ships stopped docking here until the Tidewater Terminals bought and repaired the 11,000 square foot terminals in 1950. The company operated successfully in this location until another fire burned the entire facility to the ground on June 17, 1955. Although the cause was never determined, one of Charleston's most devastating fires started with a puff of smoke at the Cooper River end of the southernmost pier. According to newspaper accounts of the fire, "in less than five minutes the entire south pier and warehouse was ablaze" and quickly moved through the other structures. Two men jumped from the docks and were later rescued and a quick-thinking merchant marine officer was able to save a small freighter and its crew who were offloading sugar into the Pier 3 warehouse when the the blaze erupted. Tidewater Terminal's vice president Louis L. Henniger went into the company's offices to retrieve company records, followed by Private Lawrence B. Aytes of the Charleston Police Department; unfortunately, both were lost to the fire. Some 550 civilian and military personnel helped battle the blaze and contain it--there were 15 fire engines and six boats pumping water onto the fire at the same time--but a strong northeast wind sent huge sheets of blazing roofing flying as far away as King Street. Many small fires had to be put out as well, including one in the steeple of St. Michael's, but none caused any major damage. Thank goodness! Top: The 1979 waterfront blight. Bottom: Riley Waterfront Park. Photos: Sasaki & Associates. Damages from the fire were assessed to be upwards of $3 million, but as far as the community port facilities were concerned, those in the shipping business said that the greatest loss was the 10% of Charleston' wharfside storage space. The terminal could only use its comparatively short riverfront pier, since the slips extending into the river had been silted in and had been abandoned. Plans to rebuild the terminal were cost prohibitive, so the previously vibrant waterfront was given over to the elements. In 1976, philanthropists Charles and Elizabeth Woodward made a donation to the city for the restoration of Adger's Wharf and a small park to the south. 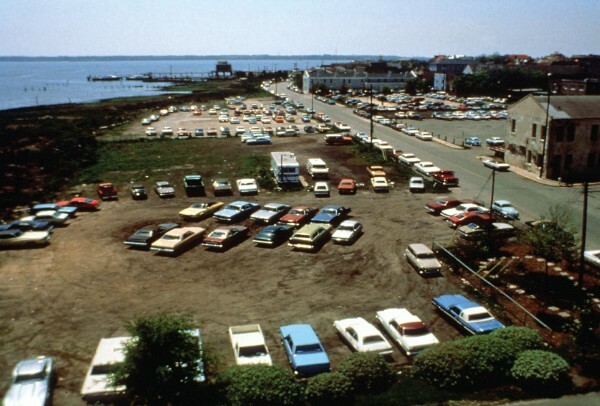 This inspired newly-elected Mayor Joe Riley to develop a concept for an expanded waterfront park, and in 1980 a grant-sponsored study commenced to assess the feasibility of turning this overgrown blighted area of gravel parking lots and charred pilings into a large waterfront park. The project was designed by Sasaki and Associates and cost $14 million to complete. Ten years later, the park opened just prior to Spoleto Festival and has been a favorite of locals and visitors alike since then. The Waterfront Park has won many design awards, including the Landmark Award from the American Society of Landscape Architects and National Trust for Historic Preservation. This award recognizes a "distinguished landscape architecture project completed between 15 and 20 years ago that retains its original design integrity and contributes significantly to the public realm of the community in which it is located." Indeed, it is. The park was renamed Riley Waterfront Park by City Council last fall. Just across the street from the park's main entrance is a luxury condominium complex where Ruthie just listed a home for sale. Unit 106 at 175 Concord Street is a two bedroom, two bathroom condominium with a gracious open floor plan and lots of light. Wouldn't you love to be able to have this gorgeous park in your front yard? Please call Ruthie at 843.729.1290 to schedule a showing!